Farmersgirl Kitchen: Can I do you now, Sir? 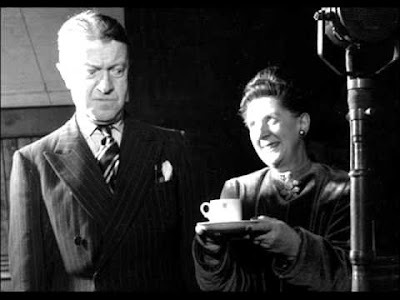 Tommy Handley in ITMA with Mrs Mopp, the office char, played by Dorothy Summers. It's really quite surprising just where my blogging journey takes me and what I find out along the way. As an OXO Good Grips Blogger, I was offered this nifty extendable duster to review and the first thing that popped into my mind was 'Mrs Mopp'. I had no real idea who or what Mrs Mopp was, just some sort of 'folk memory' of the phrase and it being something to do with cleaning. My search took me imediately to the radio show ITMA (It's That Man Again) which starred comedian Tommy Handley and featured many well known comedy actors of that era including Hattie Jacques and Molly Weir and Maurice Denham. How incredible then, that a character from a pre-war radio show should endure until today! 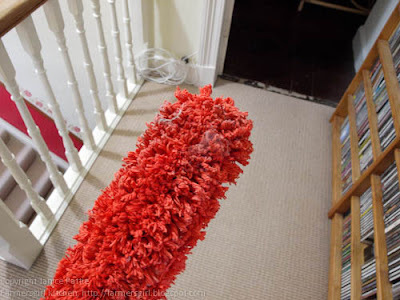 I guess it would have been a programme listened to by my parents when they were children and the strength of the connection between the name of the character 'Mrs Mopp' and her job as a cleaner has helped it to stick in people's minds, as well as the catch phrase "Can I do you now, Sir". I can't claim to be the world's greatest housewife, Anthea Turner and Mrs Mopp have nothing to worry about from me! 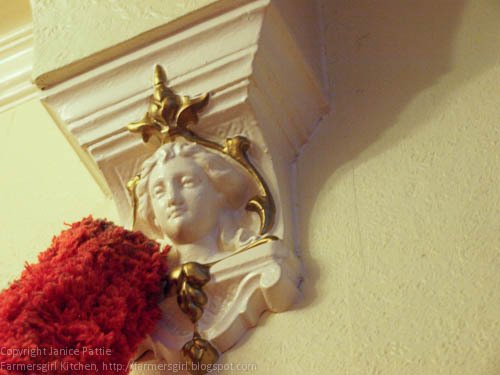 As I live in an old house with lots of nooks and crannies, dusting can be a bit of a nightmare. I loved the way you could get in between the newel posts with the long slim head of the duster. 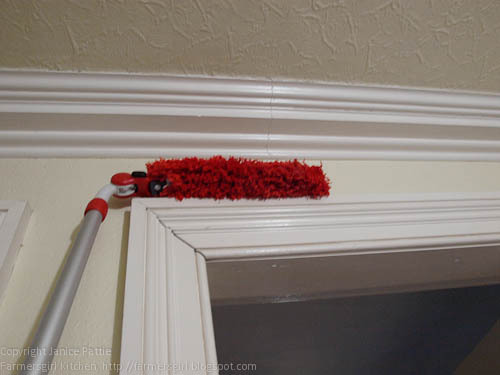 The long handle makes it easy to reach those out of the way places. My favourite thing about this duster is the way you can angle the head to dust round the corner! There is a button on the side to adjust the position of the head so it stays in the place. The ladies got a little tickle too! Yes, that is a lot of dust and I am a slovenly housewife, but the tops of my doors are quite clean now. 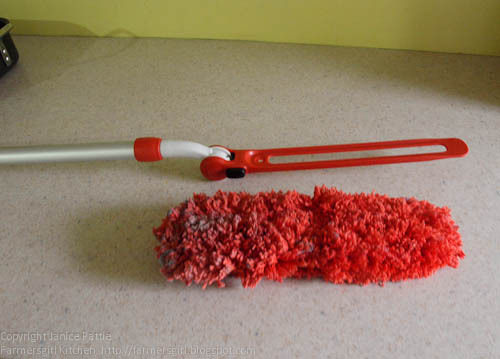 The duster is attached to the handle with a pop fastener, so you can take it off and wash it, which I did. No colour came out of the duster so it's quite safe to wash it with other coloured items. I've only washed it once and a few bits of orange fluff came off it, but not a huge amount and easily removable. 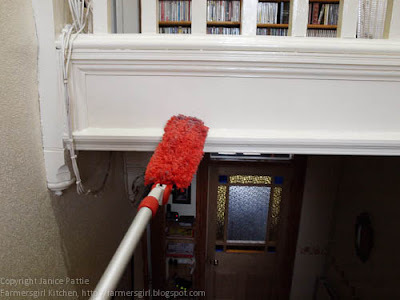 I also tested the OXO Good Grips Dust Pan & Brush Set the rubber lip on the dust pan means you get really close to the floor and don't end up with a line of crumbs underneath. 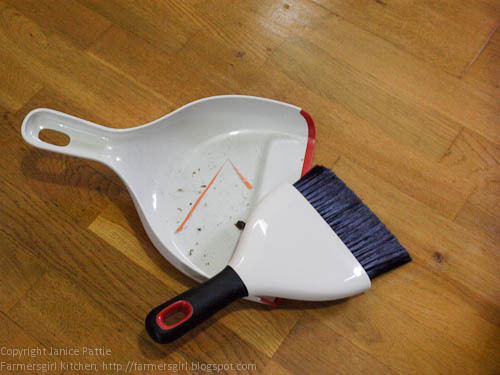 Not a lot you can say about a dust pan and brush - it works and the brush clips neatly into pan for storage. 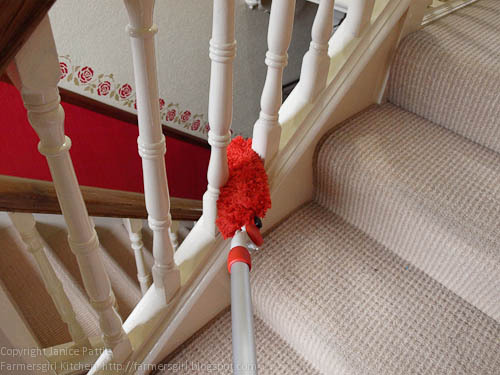 RRP for the extendable duster is £15.00 and £9.00 for the Dustpan and Brush. 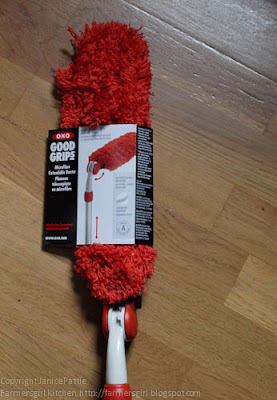 I was supplied with these products by OXO Good Grips UK for review, I was not paid for this post and all opinions are my own. lmao, janice I have one to test too, mine is just full of cat hairs at the moment...but it WORKS! i'm loving dustercam... this has had me chuckling for the past 5 minutes... i'm not quite sure why I think its so funny but it is... will we see further adventures from the dustercam soon? Dom: I'm afraid that's unlikely to happen for about 6 weeks, I did say I was a slovenly housewife! Sue: err that'll be a NO then, struggle to do my own never mind yours! I was intrigued by your blog title, I don't know this catchphrase. I think I need one of them, multi-tasking mops too.